This pic of brothers Greg Day, from left, Anthony Day and Steven Bennett inspired Richard Deitsch to ask Twitter users for their best photo moments. (CNN) -- Richard Deitsch was perusing Twitter when one photo made him stop. At first glance it's unremarkable, not much different from any other victory photo. 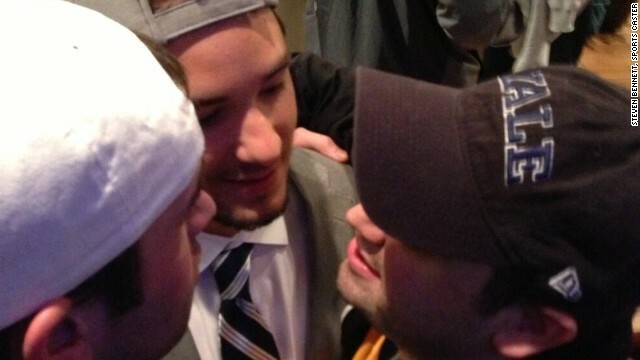 It's a bit grainy and shows three young men smiling and hugging. One of the men had just won an NCAA hockey championship at Yale. Deitsch said he was struck by something more than just the photo. He knew the man who posted it, Steven Bennett, host of a Buffalo-based sports podcast. Bennett is in the picture celebrating his younger brother's victory, despite having just spent more than six weeks in the hospital. "You gotta come now," Bennett remembers his younger brother, Anthony Day, telling him over the phone. Bennett made it for the semifinal, which his brother's team won in overtime. For the final game, Bennett was joined by 23 family members, one of whom snapped the photo of all three brothers embracing. "I thought to myself how remarkable it was to have an image of what was clearly one of the best moments of Steven's life," Deitsch said. "I wondered: How many others have a similar image? So I took to Twitter and asked," he said. He credited @Sports_Casters, one of Bennett's accounts, for the idea in his tweet. And just like that, the heart of the Internet broke wide open. "I could never have expected what came next," he said. Deitsch (@richarddeitsch) has more than 84,000 followers on Twitter. He is a writer and reporter for Sports Illustrated and adjunct professor at Columbia University's Graduate School of Journalism. He considers himself well-versed on the power of social media. By comparison, @Sports_Casters is a tiny account with only 676 followers. But as people began responding to Deitsch with their birth, reunion and marriage proposal photos, they were also sharing them with @Sports_Casters. Both were humbled and grateful for the opportunity to showcase the best of humanity. Hundreds of photos have been shared with both accounts, and continue coming in, Deitsch said. Scrolling through his newsfeed, one finds photos of a child's first day of school and high school graduations. A child meeting a sibling for the first time and a baby recovering from open-heart surgery. But there are also unexpected moments of joy witnessed, like a long-married couple exchanging a final goodbye, hard-earned sports victories, and the day a woman opens her eyes after undergoing a heart and double-lung transplant. Ryan Kaltenbach (@RyanKaltenbach) sent that photo. He said it was taken by his mother-in-law in February of 2012 as they waited for his wife, Sharlie, to open her eyes in a hospital room in Palo Alto, California. Sharlie was born with cystic fibrosis, a genetic and potentially life-threatening illness that attacks the lungs. Ryan said in the eight years they had been married, he had seen her health deteriorate to the point that she required oxygen to do the simplest tasks, including playing with their then 5-year-old son. In the 17 months since the surgery, Ryan says Sharlie is unrecognizable. "She swims. She exercises every day. It's a 180-degree difference," he said. When Ryan first saw Deitsch's request for photos of best moments, he immediately knew what to send. He says he looks up to Deitsch a lot and finds him a great person to follow on Twitter. "I am stunned at the volume and how many strangers trusted me with their images," Deitsch says. "But I'm not stunned at the humanity because it exists on Twitter, even amid the hate and snark." When asked what he learned from this experiment, he said, "It reinforced what I already know: The power of social media is stunning. Nothing about this was expected or planned which is why it's the best thing I've ever done on Twitter." Mobile users unable to see the Storify below, please click here. CNN's Elizabeth Johnson contributed to this report.